Preheat oven on the highest grill setting. Season both sides of the chicken breasts with salt and pepper. Trim green beans and peel and mince garlic. Set aside for later. Add olive oil to an ovenproof frying pan over medium heat. Add chicken breasts and fry each side for approx. 8 min., or until almost cooked through. Top each piece with a slice of cheese and one slice of prosciutto. Transfer to oven and grill until cheese turns golden and bubbles up. Melt butter in another frying pan over medium heat. Add green beans and garlic. Season with salt and pepper. Sauté until green beans are tender but still a bit crunchy, approx. 8 – 10 min. 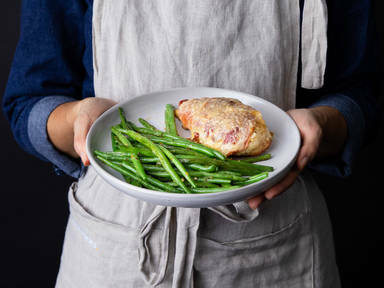 Serve chicken with green beans and enjoy!